It doesn't really feel like summer here. Don't get me wrong. I love these mild temperatures and that I neither miss the temperatures that could go up to 100 degrees nor the thick embrace of humidity. This summer is perfect! I haven't been blogging, as I've been spending more time with my parents. Mom and Dad flew home two weeks ago. I miss them already. I've gotten used to having them around and I'm so thankful they were with me every single day of my chemo days. Sometimes, I still feel that my transplant just happened yesterday. Today, I am 213 days post transplant, and I am thankful each day I am here. Well, I have a few things planted around the house. Most of them were planted by my Dad. It's funny how we Filipinized the house. It's even cooler when my American husband embraces all these gestures. These days, you can find Kepi eating Chicken Tinola with Bitter Melon leaves. Bitter Melon - I never noticed how pretty the flowers are. We planted the Japanese variety - Futo Spindle. I've been harvesting the young leaves and adding them to my Chicken Tinola and even Ginisang Mungo. 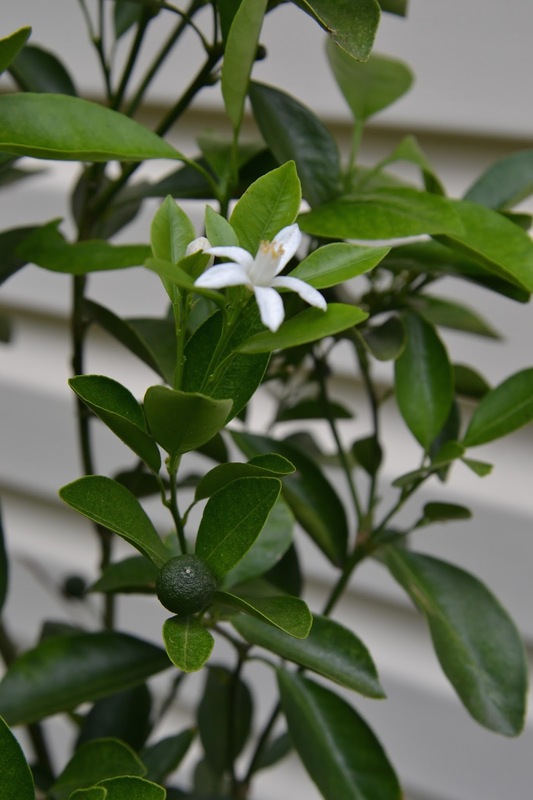 The Calamondin has sprouted back to life after being kept indoors for the duration of winter. Yes, I also have Malunggay. 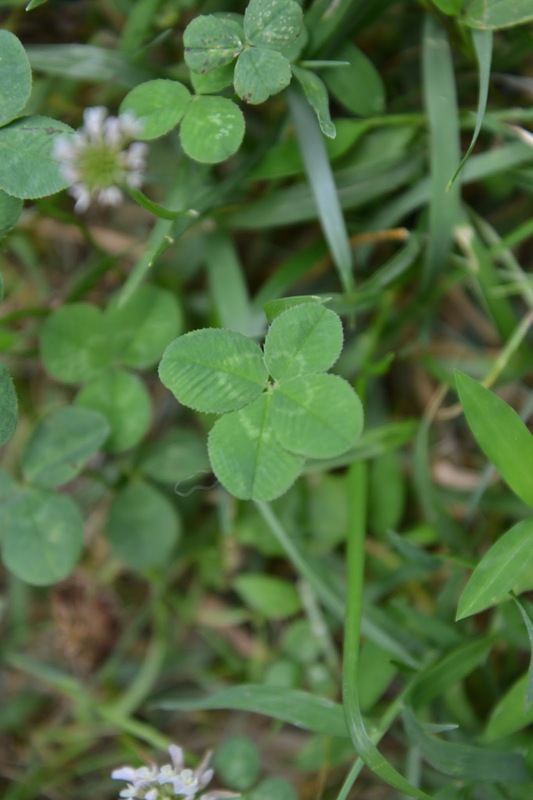 If I'm not doing anything and boredom hits me, Daisy and I would go on the yard and hunt for these four leaf Clovers. We've been lucky so far. This isn't really part of Filipinizing the house, but it's a tribute to my husband's Irish heritage. Here's my four-leaf Clover sniffer. oh my goodness, i'll try to plant bitter melon next summer. this summer was a bust with the vegetables. none of my lettuce grew, mostly because stray cats used the pot they are planted in as bedding and lounging area, then the weird weather has made the growing conditions impossible for the plants. maybe next year we'll have more success. nice to see you're busy with the garden. Photo Cache, I've been loving the bitter melon leaves. 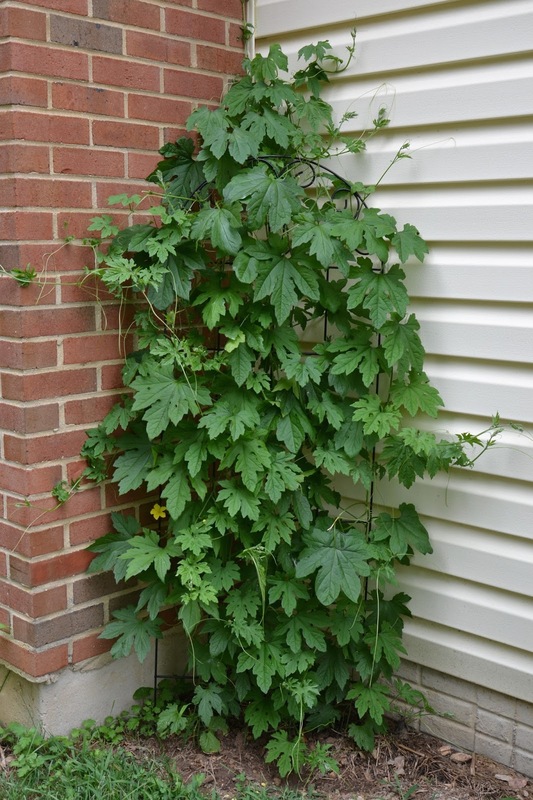 You have to plant them next year. Gardening is keeping my mind busy. Nice to know you're doing better....I've always wanted to have my own Filipinized garden of sorts...but none of it is available for me to puchase in Korea....kkkk. P.s. I love tinola with malunggay and talbos ng sili...my kids eat Filipino foods a lot kkk. When my husband is on a business trip or working late, it's almost automatic for me and my kids to have something Filipino on the menu. Oh yes, I love tinola with malunggay. I had to do bitter melon for now because I was told it helps with my anemia recovery. I'm so glad your kids love Filipino food. Filipino dishes are a hit or miss with my husband. Adobo is the only dish he'll eat for sure. She is super cute, and she knows where the clovers are. She's been a joy since she arrived. So envious of your Bitter Melon plant (My son calls it Bitter Gourd lol!). It's one of my favorite ulam whether with moggo, pakbet, or sauteed with egg. Sadly we can rarely buy the leaves at the Asian store. Even Sili leaves, don't come often here. It's so good to know your Hubby likes Filipino food, Ate Enden's Hubby too is very fond of Pinoy cuisine. He has more knowledge of the best Filipino restaurant in Cali. And he even took us to DJ Bibingkahan in Las Vegas hihi. I mailed some postcards yesterday. Im sorry it took awhile because the shop ran out of stamps and they only restock yesterday. When i first tried to mail it, only one stamp was available and both seller and I thought it might not be enough to reach USA hehe. Thanks again and give Daisy too a big hug from all of us here! I gave Daisy your hug :). I'm glad you got my letter. Lots of hugs to manong C and little C and to you, of course. Guess what, I'm playing barter system. There's a Filipina here who can bake pandesal, pandecoco and other pastries, and I'm exchanging Bitter Melon leaves for some pastries and bread. My dad planted these Bittermelon plants. He has the "better" green thumb in the family. Onyxx, Daisy is a rescue and we're not sure how old she is. The vet said she's between 9 and 12. She has a lot of energy though. She's a Golden Labrador mix.